There are certain skills that need be learnt when improving in the kitchen, and mastering the art of a good omelette is one of them. It’s not uncommon for chefs to ask potential apprentices to show their omelette skills – and there’s a reason for that. Preparing an omelette shows the chef many things, including your plating abilities (how you present a dish) and how well you can cook a delicate ingredient (the egg). 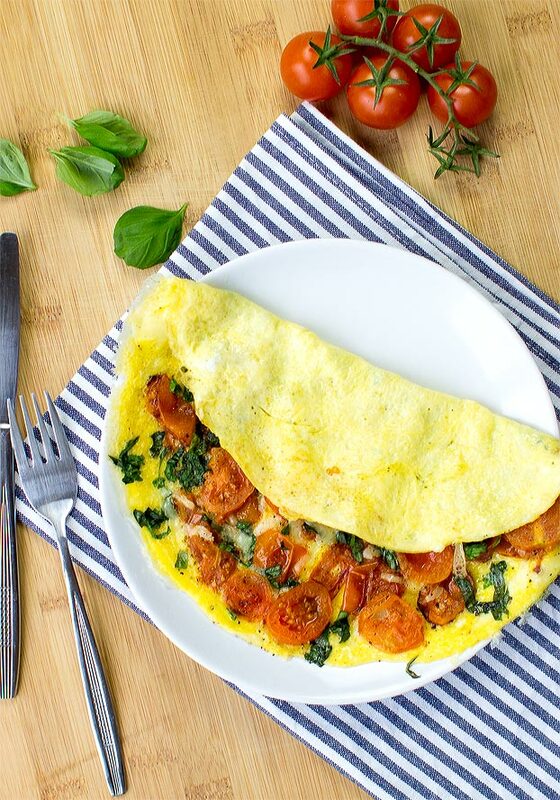 We’ve opted for this tomato omelette version for a little more kick. 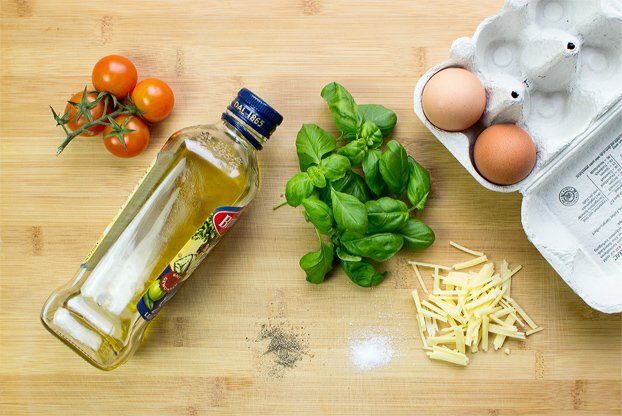 All of the greats can make a fantastic omelette. 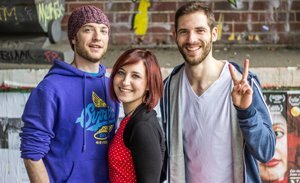 Jamie Oliver, Gordon Ramsay, the legendary Julia Child – each puts their unique touch on it – but they all agree on one thing. DON’T overcook the egg! An overcooked egg turns rubbery or leathery and is absolutely not what we want. No, we want a smooth, soft, gently cooked egg. An omelette needs some love. As the great Jamie Oliver says: ‘if it’s cooked in the pan, it’s gonna be overcooked on the plate’. He’s absolutely right – the omelette finishes cooking itself. There are other questions that come up when cooking an omelette. Oil or butter? When do you add salt? And what heat? Let’s take a look. First up – olive oil or butter? This is a very good question. Over the years, each has had its fair share of nay-sayers – butter makes you fat, olive oil can’t be used to cook at high temperatures and so on. Valid points, but not necessarily applicable here. While the health benefits of olive oil are well documented (and it really is great! ), butter is no slouch either. The biggest concerns are generally the fat content, however most of the fat in butter is saturated and not trans (the worst kind with the least benefits). It’s a complicated issue, and Harvard explains the different types of fat very well here. The Telegraph also does an excellent job of summarising the confusing science reports of recent years. If you’re unsure of which to use, then at least until the next report is delivered, olive oil is probably the healthier choice to take. Because we’re not cooking on a high heat, we don’t need to worry about overheating the olive oil. Talking of heat – don’t over do it! 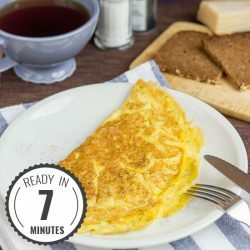 A medium heat is more than enough for cooking, and after layering the insides of the omelette with the cheese and tomatoes we want to turn it back down to low. As mentioned, we don’t want an overcooked egg here, we want a smooth, silky and gently cooked omelette. The outside doesn’t even need to brown. When to add salt. 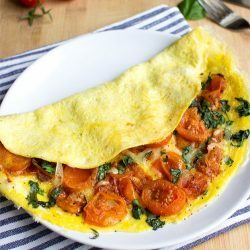 Although many chefs add the salt to the omelette after it has cooked, through numerous omelette making days I can safely say it makes no difference to the taste of the tomato omelette. When is the omelette ready? As stated, ‘if it’s cooked in the pan, it’s gonna be overcooked on the plate’. This means it’s time to fold the omelette when you can still see just the tiniest layer of uncooked egg on top of the unfolded omelette. Then, by the time it’s folded over and slid onto the plate, the insides will have finished cooking. It’s an art, but it’s an easy art. Practice makes perfect as they, and perfect you can be! 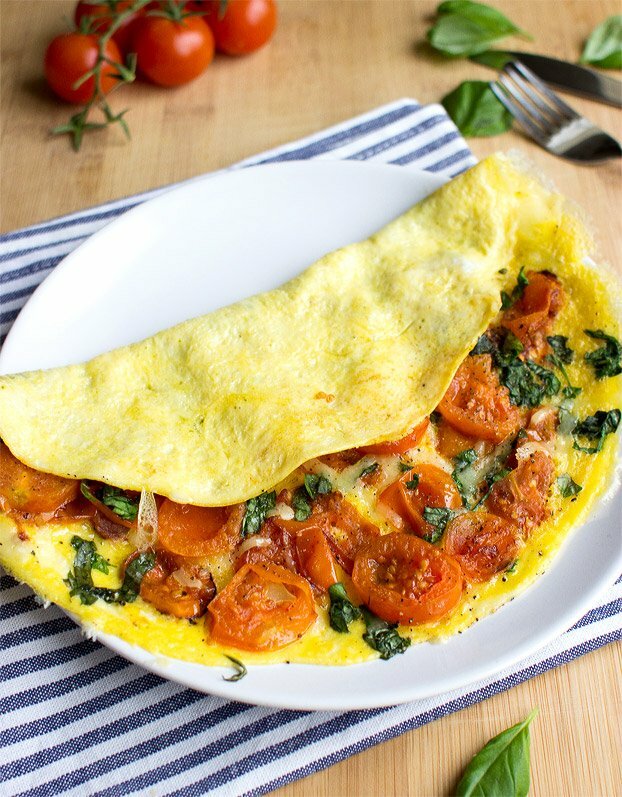 Easy Tomato Omelette. 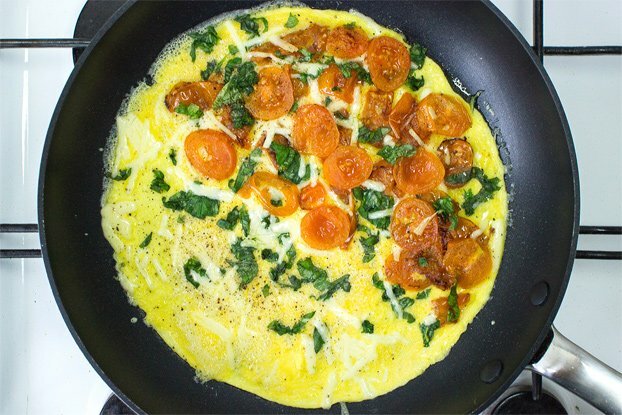 There is a trick to making the perfect omelette - and it’s weirdly easy. We’ll show you how. You’re gonna love this one! Wash the tomatoes (and spring onions or chili if you’re using them) and chop into small pieces. 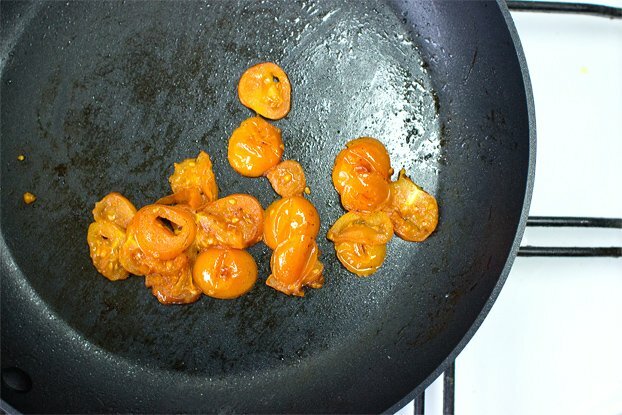 Heat oil in a pan and fry the tomatoes for about 2 minutes. Set aside. Clean the pan with a tissue. 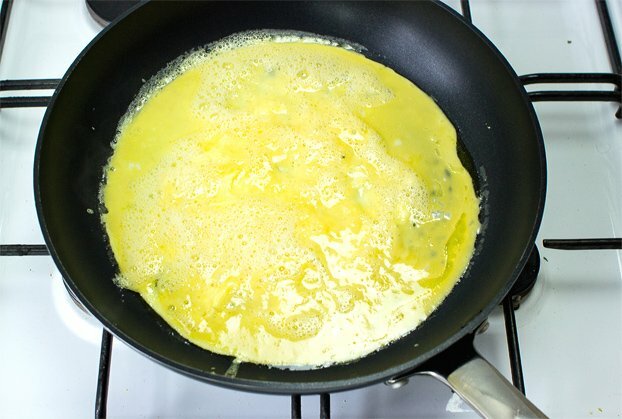 Using a spatula, ruffle the omelette so it doesn't stick. As you create gaps tilt the pan so the liquid fills the spaces. 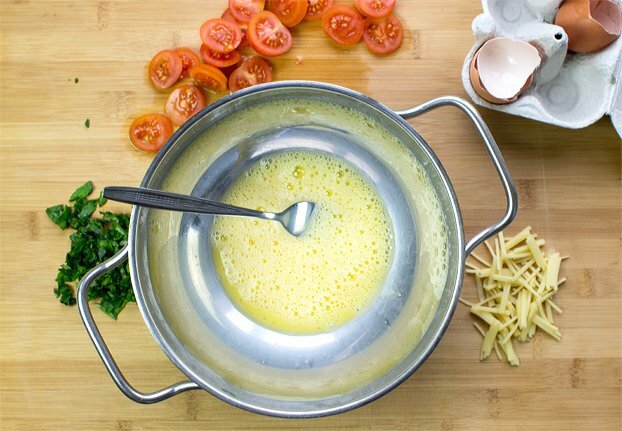 Here's the important part: when the egg mixture looks nearly cooked (but there's still just a tiny bit of runny egg left) drop on the tomatoes and basil (and cheese, spring onions or chili if you’re using them). Fold the empty half of the omelette on top of the other. Slide it onto a plate - the heat from closing the omelette will finish cooking the inside. If you enjoyed this recipe: Then make sure you check out some other eggy dishes! We’ve got the great British Eggy Bread, or these spectacular breakfast egg muffins. There’s even a homemade baked beans recipe if you fancy a delicious side to go with the omelette. Easy and delicious. One of my favorite breakfast foods with the addition of spinach. I love your recipes. I’m still excited about the three ingredient pancake. 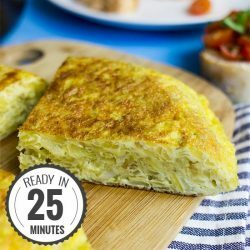 Great recipe, super easy and delicious ! Very healthy. Don’t worry about the cholesterol as studies have shown that ingested cholesterol is not related to blood cholesterol levels. 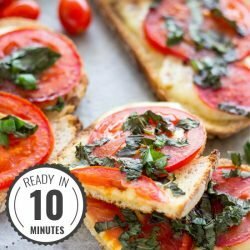 I am allergic to tomatoes, so what can I use instead? Also is Himalayan Salt as good as Sea Salt? Grapeseed Oil as good as Olive Oil. ?